Vista Villa offers panoramic views and a small, private beach next to a reef perfect for snorkeling. The home is done in beautiful neutrals and reads like a Who’s Who of designers—Phillipe Starck, Porta Roma, Kelly Hoppen, William Yeowood, And So To Bed, and Kohler. There’s also plenty of original artwork and a book library. In short, Vista Villa is a quiet, classy retreat that makes for a wonderful vacation. Small slice of sand on the property! 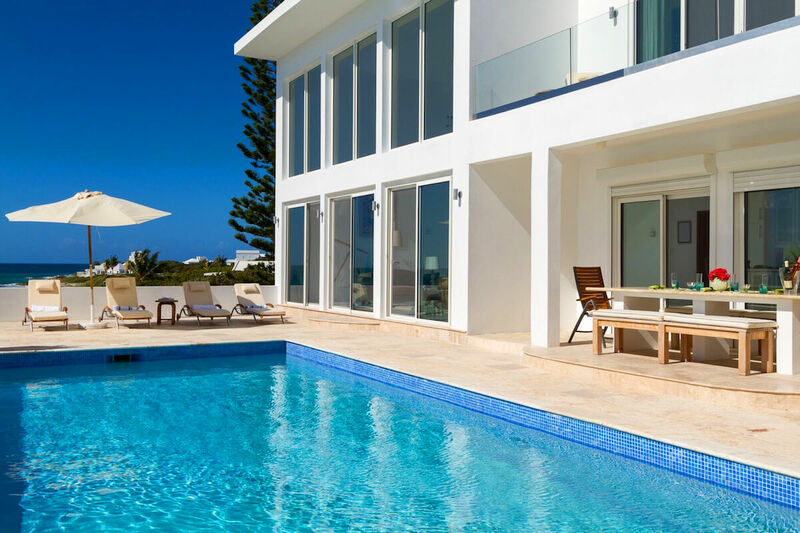 Vista Villa is a contemporary villa located on the Blowing Point waterfront. The home has views of St. Martin and walls of floor-to-ceiling windows to draw the ocean in. Vista is fully enclosed behind an electric gate and has a security system that’s monitored 24 hours. The villa’s infinity pool is surrounded by a spacious deck with comfortable sun loungers and a hammock. Guests can dine al fresco under the veranda and gaze out at the sea. There’s a small, private beach at the end of the path, and Vista provides snorkeling equipment and life jackets for anyone who wants to jump in the sea. Workout in the air-conditioned gym/game room on the exercise bike, free weights, Pilates equipment, weights, and yoga mats. There’s even a vintage pool table for game nights. Vista has been designed for adequate social space, as the main section of the house has a semi-open floor plan. The sitting room has a 20-foot ceiling with double height windows and features a chandelier by Jonathan Adler. The walls are adorned with original artwork, including a piece from the acclaimed artist John Bellany. The kitchen is fully stocked and equipped with modern appliances, like a Nespresso machine. The center island doubles as a breakfast bar. WiFi, Bose speakers, board games, and books round out the home’s amenities. Daily housekeeping maintains the villa. All four bedrooms in this villa are air-conditioned. Three have ensuite bathrooms and the fourth has an adjacent shower room. All the bath and shower rooms have Anguillan stone, designer fittings, and rainwater showers. The upstairs master suite has stunning views from its private sun deck. A beautiful antique French armoire, chaise lounge, and matching master bed provides a serene retreat. The master suite also has a dressing room with a mini fridge. The large ensuite, airy bathroom has a bath and shower by Phillipe Starck. The ground level has a king suite and a queen suite, and both have flatscreen TVs and ensuite bathrooms. The fourth suite has two twin beds and a flatscreen TV, with access to the hall bathroom. Blowing Point is home to Anguilla’s ferry and boat charter companies. Rendezvous Bay is also nearby, and has several restaurants and attractions. Taxi is arranged to meet guest at the port of entry (airport or Blowing Point ferry dock - at guest expense) and are greeted by villa staff upon arrival to give a tour and answer any questions. The taxi is at the guests expense. Welcome over 12 years of age please. Vista Villa has a great location and nice breezes. The house was great. Our service from WhereToStay was excellent, as always.